Jesús Tiamo (born January 1, 1961 in Puerto La Cruz, Venezuela) is a coach in Major League Baseball. He serves as the bullpen catcher for the Philadelphia Phillies, a position he has held since 2009. He wears number 81. Tiamo spent three seasons in the Pittsburgh Pirates system, from 1980 to 1981 and in 1983. In 1980, he hit .303 with 19 RBI for the GCL Pirates. In 1981, he hit .267 with five home runs, 75 RBI and 13 stolen bases for the Greenwood Pirates and in 1983, he hit .261 with three home runs and 43 RBI for Greenwood. In total, he hit .268 with 8 home runs and 137 RBI. He thereafter spent seven seasons with Navegantes del Magallanes of the Venezuelan Professional Baseball League. 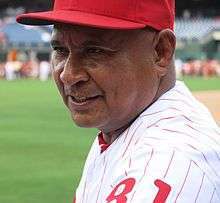 He also played for the Venezuela national baseball team in the 1979 Pan American Games. Prior to serving as the Phillies' bullpen catcher, Tiamo coached in the minor leagues for the Chicago White Sox from 1995 to 1999, the New York Mets from 2000 to 2007, and the Phillies in 2008. ↑ "Manager and Coaches - phillies.com: Team". MLb.com. Retrieved April 16, 2012.